Can love find a way this Christmas? Christmas 1941, Isle of Dogs. The little community on Slater Street has fought valiantly to keep their spirits up through the long nights of the Blitz. Though her husband, Alan, has been called up to serve his country, Kay Lewis is determined to give her young son Alfie and friend Vi as merry a Christmas as any other. But when a strange woman and her son arrive on her doorstep, Kay's world is shaken to the core. Could the terrible accusations that Dolly makes about Alan be true? Could he really have been leading a double life without her realising? Has he really stolen a large sum of money from Dolly and her son, Sean? Then disaster strikes as Alan is reported missing in action. With no way of discovering the truth, Kay will have some difficult decisions to make if she is to protect her family and keep her faith in the man she thought she knew. A moving tale of triumph in the face of adversity, A Wartime Christmas will transport you to a period when the Christmas season was a beacon of hope in the darkest of times. The book felt light even with the heavy background at hand. I liked that as the pages just turned themselves that way. East End during the blitz. Horrors daily and fear, but Kay just lives her life even if it's tough. She misses her son who is evacuated. She is married to Alan who, yes who has secrets and I kept wondering through out the book what really was going on with him. There is a good cast of side characters too, Viv who lives next door and then a bunch of other neighbors who lives on the street. And then there is a bitchy woman who shows up and she, arghh, so deserved a smack over the head. She brings something new into the story, good and bad things. There is also more than one Christmas in the book. The book starts during the blitz and ends after the war is over. A good book with interesting characters and the same goes for the scenery. I enjoyed it. I've decided I don't like for historicals to have modern photos on the covers. Sounds like a good Christmas read! I agree with Chris. That looks to modern for this book! I like books like that and the characters sound very interesting. I confess I didn't know this one. This sounds good, and I love that it spans the war. I love wartime books and this sounds perfect for the holidays, but I could do without the bitchy woman. This sounds like something I would really like and I do want to fit some Christmas themed books in this year. Glad you liked it. This does sound like a good historical. I love books with Christmas in the theme as well. Okay I am intrigued here. Thanks for the review B. This sounds like a good book to read during this Christmas season. For some reason I shy away from holiday reads but I do like the sound of this one. Ah. Like Mishel I shy away from Holiday reads...I don't really do it consciously though. lol. This does sound rather good...I need a good WWII book. This one's new to me but I do like the sound of it! Sometimes you need a bitchy character to stir things up. :-) I love characters who I want to smack upside the head, it beats characters I feel "meh" about. 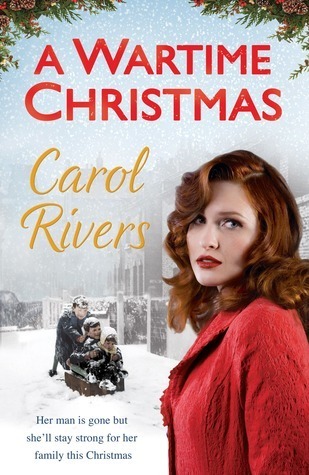 This book sounds wonderful, Christmas plus wartime historical. Lovely review! I'm definitely not a fan of the cover, but it sounds like a book I'd enjoy, too.